Steam bell peppers in a large pot for 5 minutes or until slightly soft. Heat oil in skillet and sauté the onions, garlic and carrots on medium-low heat until soft. Add mushrooms and cook until soft. Stir in cooked quinoa. 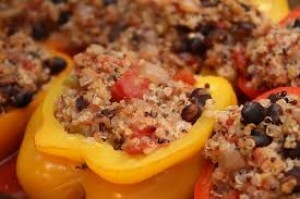 Read directions on how to cook quinoa as it needs to be prepared before beginning this dish. Add broth, spinach and parsley and cook for 2 more minutes. Scoop one fourth of the mixture into each pepper half, packing firmly. Place peppers in a baking dish. Cover the bottom of the dish with 1/2 cup of water. Cover with foil and bake for 30 minutes, until filling is hot.